Happy Sunday! 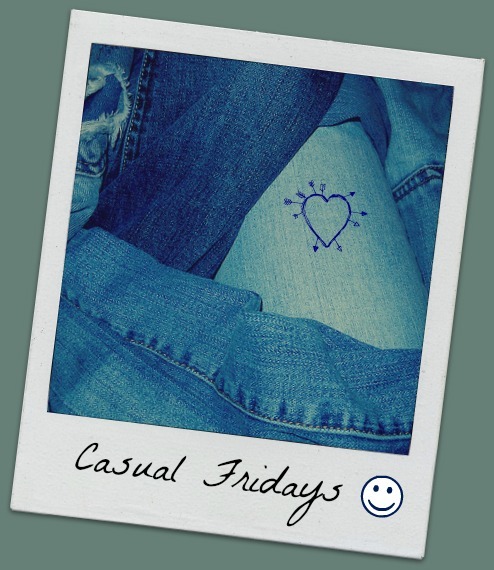 That means it is time for the latest installment of Casual Fridays (Sunday edition), my weekly chat post – no structure, no rules, no prompts, anything goes. And please also check out Casual Fridays over at Helen’s blog, Good Woman. It’s Sunday afternoon and I’m just getting around to Casual Fridays. But, in my defense, it has been a busy weekend. It’s the last weekend before school starts. I actually had a pretty good week at work. Things are starting to settle in. On Wednesday, I went out to the suburban office – which is where I worked before I lost my job four years ago. It was so nice to be back there and to see all of my old coworkers. I will be going out there one day a week and I will be at my normal downtown office four days a week. We had a girl scout recruitment event Wednesday at the pool. My girls were happy to get to swim since we haven’t been to the pool much since swim lessons ended. We may be adding some new girls to the troop which is always… interesting. The pool time was unfortunately cut short by a storm. This has been the rainiest summer ever. Yesterday was spent shopping for back-to-school shoes and clothes. It is also tax-free weekend in my state so the stores were packed. Shoe shopping turned out to be far easier, we only had to go to one store. We were even able to find acceptable shoes for my picky sixth-grader. Clothes shopping was more strenuous as both of my girls are hard to fit. But after schlepping from store to store for hours, we were able to get enough jeans, leggings and tops to start the school year. It was a long day and I came home and had to recharge my social batteries. To reward myself yesterday, I got a new purse. And I absolutely adore it. Today we organized and labelled school supplies. Everything is sorted and ready to go to school on Tuesday for open house. My sixth grader is so nervous about switching classes this year. There have been tears. We wrote out her schedule today for A and B days and put it in her binder. We will find all of her classrooms on Tuesday and reassure her again. Growing up is so hard (on everyone). I’m really proud of her, by the way. Her favorite part of shopping day was not the clothes but wandering around Barnes and Noble browsing the books. It was sunny this morning and my husband put our dog outside on the zipline. I was laying in bed and all of a sudden I heard rain on the roof. I looked out the window and it was sunny and pouring down rain! Even on our nice days we get rain. My daughter ran out to get Rusty, who was barking and not too happy about getting wet. Strangely, the little cloudburst only lasted a few minutes. Have a great rest of the weekend and upcoming week, everyone!